Hello everyone! Today I'm sharing another Christmas card I made with this month's release by Our Daily Bread designs, "Ornament". I am just in love with this ornament! 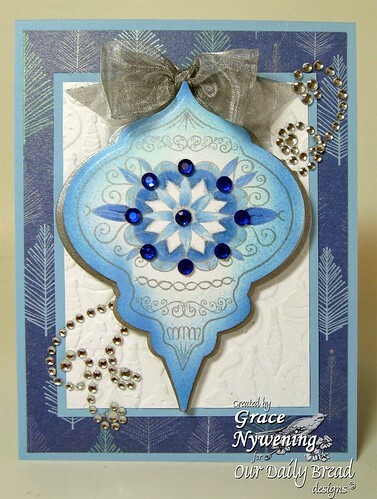 I love how perfectly it fits the Spellbinder's Heirloom Ornament die and how versatile it is! I used Midnight Madness Sketch 84 for this layout. If you haven't checked out Midnight Madness this month, you should! All the sketches are up for the whole month and you can make any one as you are able! We had a little snow Sunday here and it was blustery cold all day today, so this made me think of white and sparkle. This is what I came up with. I stamped the ornament in Stazon Silver and colored lightly with Copics. I matted the ornament with two of the same size die cuts from silver that I had left over from another project. This gave just a little depth to the ornament. I used a Cuttlebug ornament embossing folder from the Winter Wonderland Bundle, May Arts Silver ribbon and the dp is ADT Momenta Specialty Collection "Jack Frost". It's a sparkly paper. The base is Martha Stewart and the white is Gina K Pure Luxury. The bling is from Micheal's. This is so pretty. I love all of your shades of blue! Beautiful card - love the colur choice. So pretty and soft, I love it and I also love that stamp set. It works so well with those dies. How absolutely GORGEOUS Grace, WOW I LOVE that ornament with the bling!!! This really pops off the screen sweetie, another amazing creation! This is beautiful Grace. I can see why you love this set. Your sponging is perfect. Hope you had a great weekend. Brrrr it's cold. This is beautiful. I love the colors. Thank you so much for playing with us at Stamping With The Dragon. So gorgeous, Grace!! So different, very pretty! Oh how lovely!! Beautiful. Thanks for joining in with The Stamp Man challenge. What a wonderul card Grace,I love the image. So beautiful papers and the colours. Beautiful blues and the ribbon is gorgeous. wow a fabulous card, thanks for joiing our christmas challenge at SAM. Wow this is stunning that image is beautiful so is the colours and design thank you so much for sharing this with us at Creative Inspirations. Wow Grace,this is gorgeous!I love the blue and your amazing coloring!I love it! Thank you for visiting my blog and following me! This is gorgeous Grace!! I just love the ornament and blue!! Stunning my friend. Very Pretty. Love the blues. Thanks for playing with Lets Ink It Up. What a gorgeous card! Love the colors and the bling. Thanks for joining us for our embossing challenge at delightful Challenges! Ooooh pretty pretty pretty! Thanks for playing along with Just Us Girls. So pretty! Love all the blues!Thanks so much for playing along with Just Us Girls this week! Beautiful card. Thanks for playing along with Stampin with the Dragon. Grace, what an elegant looking ornament. What else can I say...this is just stunning!!! A stunning Christmas card. Thank you for joining us at Creative Inspirations this week. Have a wonderful Christmas. This card is gorgeous! Is the ornament detachable??? Thanks for the comment you left on my blog! Oh I love your die cut. Thanks for entering the challenge at creative inspirations and have a wonderful christmas. WOW! what a gorgeous card! Thanks for sharing it with us at stamps r us. Oh, I just love this card Grace. That ornament is beautiful. May I take the opportunity to wish you and your family a very blessed and happy Christmas. Stunning creation perfect for our sparkle challenge at LIIU. Love your sparkles. Thanks for playing at Stampin With The Dragon. Beautiful and the colours are my favorite ever thank you for joining us here at the Stampin with the Dragon Challenge Blog. Beautiful monochromatic card! Thank you for sharing your wonderful creation with us at Stamping With The Dragon. Stunning card, that bauble is just gorgeous! Thanks so much for joining in with the Creative Inspirations challenge this week. A beautiful card love that colour of blue. Thanks for playing along at CYDA this time.